By now, you should have a general understanding of how leases work and the benefits that they offer, and if so, you are already well on your way to having the knowledge you need to determine if a lease is right for you and also to get a good deal on the lease you choose. 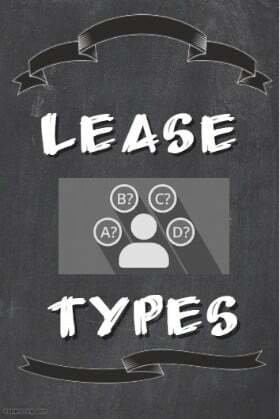 However, a deeper understanding of how leases work, the types of leases, how lease payments are calculated, and what different terms used in the leasing process mean will help you not only be more prepared to negotiate your lease deal, but will also give you the tools to avoid common dealer tricks and make the best of your lease. There are two major kinds of leases available today, and they vary depending on who takes on the financial risk that the lease entails. Laws and regulations require the type of lease to be clearly indicated on all the paperwork, so it should be very easy to tell what kind of lease you are looking at when you are reviewing your paperwork. It is very important to do so, as the wrong type of lease can lead to a very nasty surprise at lease end. A close-ended lease is the most common kind of lease, and often the only one available to private customers in many states or from many leasing companies. In this kind of lease, the leasing company is the one that faces all of the financial risk that comes as a result of a lease. The residual value determined at the start of the lease is preset, and the actual market value of the car at lease end has no bearing on the customer. You simply return the car and walk away, though you do have other options if the market value ends up higher than the residual. The leasing company, on the other hand, is stuck with the car regardless of the difference in market and residual value. This is the most common type of lease and the one that makes the most sense for most consumers, since it offers exactly the kind of flexibility and low financial risk that most lessees look for. The residual value on this type of lease is also generally higher than on open-ended leases, so the monthly payments are also lower as well. That makes it the most popular, as well as usually the smartest choice for consumers. And open-ended lease is a leasing type that is most common with business or fleet leases, rather than with consumers. In this kind of lease, it is the lessee that takes on the financial responsibility for the risk at the end of the lease. In the case that the market value of the car is assessed as being lower than the residual agreed upon at the start of the lease, then it is up to the lessee to make up the difference to the leasing company. To avoid that, open-ended leases tend to have much lower residual values than close-ended leases, and so come with higher monthly payments. However, that comes with some advantages that tend to be good for businesses. Open-end leases tend to have much better mileage allowances than close-end leases, and tend to be more generous when it comes to the end-of-lease wear and tear assessments as well. Because of these advantages, as well as the higher payments that they require, open-ended leases are usually a poor choice for ordinary auto consumers. If you are leasing a car for your business, however, then an open-end lease could be a very attractive option depending on your needs. In that case, you should consult with your business financial advisor to see whether an open-end lease makes sense for your business, as well as see what kind of tax benefits it can offer. If you are just a regular driver and do not plan on using your car for business purposes, then an open-end lease is usually not a good choice. 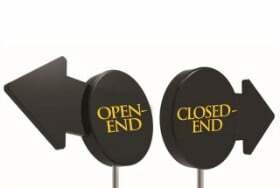 The benefits of an open-end lease are primarily geared towards businesses. A company car that is driven by multiple people for long distances is exactly the kind of vehicle that is likely to need the high mileage that an open-end lease offers, and business uses tend to inflict a higher degree of wear and tear on cars as well. The average private driver is not likely to run into these limitations however. Instead, an open-end lease is likely to only confer disadvantages with its end-of-lease payments and higher monthly outlays. Only in very rare cases are you likely to be better off with an open-end lease as a private consumer. 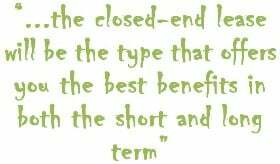 On the other hand, the closed-end lease will be the type that offers you the best benefits in both the short and long term. A close-end lease comes with a higher residual value in most cases, as well as absolves you from the financial risk at the end of the lease. The restrictions that a close-end lease brings are also usually very manageable if you are a fairly average driver. Most drivers do not find themselves putting the kind of mileage on their vehicle that would rule out a close-end lease, and it is relatively easy to keep your car in a good condition for the two to four years that such leases usually last. It is important to check your leasing contract before you sign it to make sure that your lease is the right kind. Otherwise, you may suddenly find yourself facing several thousands of dollars in residual adjustment fees when you turn your car in, as well as higher payments throughout the lease. One of the considerations that is very important in the leasing process, but is rarely discussed is the role that your choice of car plays in making the most of your lease. Make, model and even specific trim level and configuration can make a huge difference in the kind of deals and payments you can expect when it comes to a lease. These choices affect several different important aspects of the lease, including your choice of leasing company, the residual value of your lease and the options available when it comes to the terms of the lease. The choice of manufacturer and brand of vehicle that you want to lease serves to determine your available choice of leasing company. Most manufacturers and dealerships usually work with only one leasing company that is either captive, meaning that is is wholly or partially owned by the manufacturer, or one that has a special deal with that particular manufacturer or brand. That alone can have a very significant effect on the final terms of your lease. Different leasing companies often use different methods or credit score cutoffs to determine the money factor - the lease equivalent of interest rate - that they charge on the leases they issue. Even with the same score, it is possible to get very different money factors from different leasing companies. Different leasing companies also differ in the kind of options that they offer for their lessees. Some, for example, are able to waive certain fees in exchange for a higher money factor, or reduce your finance charges if you are willing to pay a higher refundable security deposit up front at the start of the lease. By deciding on a certain make of car, you are effectively choosing to use a particular leasing company, so it can often pay to do research on the kind of options that leases from that company can offer. Different leasing companies also use different guides when it comes to selecting the residual values for their leases, though it is the model and trim level that can play a much greater role in the final residual value of your lease. There are several different companies and industry groups that estimate how much a car will be worth as a used car, including the Automotive Leasing Guide, Kelley Blue Book, National Automobile Dealers Association, and others, and different leasing companies use different ones. However, most of these sources tend to arrive at similar values for their residual values on the same cars. It is often the car’s make, model and trim level that plays a larger role. Your choice of car is the primary determinant of the residual value, and therefore your final lease payment. In general, the best leasing deals are on cars that retain a large percentage of their value at the end of the lease. Luxury brands of cars, as well as those with a reputation for reliability tend to get high residual value estimates, and so can be very beneficial to lease. The same goes for cars that are very popular, especially as pre-owned cars. That is why cars like the Toyota Camry or the Ford F-150 tend to offer attractive leasing deals; even as used cars, they sell very well. By comparison, vehicles that have more niche appeal or tend to be driven hard usually offer much worse lease options than other cars in the same price range or from the same manufacturer. Sports cars, for example, often have very poor residual values since they are not as popular as trucks and passenger sedans, as well as experiencing more wear and tear on their mechanical components due to the athletic driving style of their drivers. Similarly, for this same reason, off-road oriented cars like the Jeep Wrangler are poor candidates for a lease. Choosing the right trim level can also make a big difference when it comes to the residual value of your car and your final lease payment. This is influenced a lot by the equipment that various trim levels offer. Models that are equipped with the latest safety or infotainment technology tend to get better residual values than the more bare-bones trim levels. That is because features that are cutting-edge at the time of purchase often become must-haves for buyers several years later, causing cars without that equipment to suffer on the used car market. Analysts setting residual values know that, and adjust their estimates accordingly. On the other hand, cosmetic or comfort features tend to have a negative effect on the car’s residual value. Consumer tastes often change quickly when it comes to styling and design, and items like leather can be divisive, with some preferring leatherette or vice versa. A good way to see how different choice of make, model and trim can affect the residual value of your car is to search the internet for the different residual values on the cars you are interested in. In most cases, this information is easily available and can help you choose a lease that works best for you, especially in conjunction with the information on how to calculate your lease payment, which you will find later on in this guide. Your choice of vehicle is one of the most important choices that you make when you decide on a lease. Different cars not only are financed by different leasing companies, each of which has its own rules and its own ways of deciding on important values, but they also carry different expected future values. A car’s expected future value serves to determine its residual value and, through that mechanism, ultimately affects your monthly payment on your lease. Because of these factors, your car choice plays an important role, making research into the different vehicles you are interested in leasing all the more important. As mentioned earlier, one of the main companies that calculates residual values is ALG. They recently published their 2018 winners for highest residual values as a brand, and specific classes. See below for the winners.